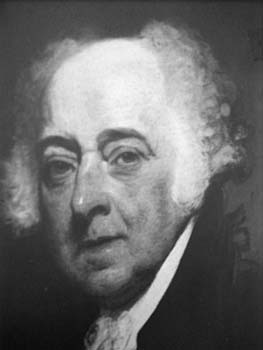 A young Massachusetts lawyer, Adams attained public notice as a leader of the Whigs during the Stamp Act controversy in 1765. His moral courage was demonstrated when he successfully defended a British soldier tried for the Boston Massacre. Elected to the legislature, he represented his state in the first Continental Congress and was instrumental in appointment of George Washington as Commander-in-Chief of the Continental Army and in passage of the Declaration of Independence. He was Commissioner to France, a Minister to Holland, and as a colleague of John Jay and Benjamin Franklin, he negotiated peace with England to end the Revolutionary War. Thereafter he was made the first U.S. Minister to the Court of St. James. In 1778 he was elected Vice-President, served two terms, and succeeded Washington to the presidency when he declined a third term. Adams and Alexander Hamilton were the foremost Federalist leaders, but Adams became embittered by intrigues and strife within the party during his presidency and, defeated by Thomas Jefferson for reelection, he retired to private life. Often bitter toward each other, Jefferson and Adams eventually became great friends and they left to posterity an interesting correspondence. Coincidentally, they died the same day, the birthday of the nation they helped build, July 4,1826.